When Sawyer Valentini (Claire Foy) is involuntarily committed to a mental institution, she is confronted by her greatest fear. However, is this fear real or just a product of her delusion? There is no shortage of films confining characters against their will in psychiatric facilities. In addition, the ‘hysterical woman’ - ignored or belittled by those in power - is a trope that feels as old as cinema itself. However, director Steven Soderbergh offers us something fresh in his horror/thriller, Unsane. 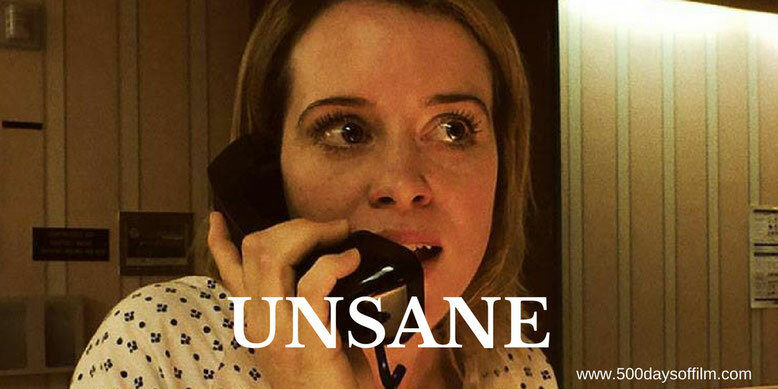 For a start, the film was shot on an iPhone 7 - technology that proves a perfect fit with Unsane's disturbing story. Alongside Thomas Newman’s unsettling score, Soderbergh makes full use of the iPhone’s disorientating movement, intense close-ups and grainy images. Filming via an iPhone could still have felt like a gimmick were it not for Claire Foy’s superb Sawyer Valentini. Her portrayal is wonderfully nuanced - giving Unsane significant emotional heft. While damaged and vulnerable, Sawyer is no simpering victim - she is manipulative, acerbic and abusive. Foy’s astonishing performance soon makes us forget how the film's images were captured. Unsane also features an impressive supporting cast including Jay Pharoah as Nate and Amy Irving as Sawyer’s mother. Meanwhile, effortlessly stealing every scene, is Juno Temple. She is brilliant as unpredictable psychiatric patient, Violet. The reasons behind Sawyer’s confinement also feel new in Unsane - shining a disturbing light on several troubling issues. At its core, Unsane is a movie about stalking and our failure to protect its victims. Sawyer is left haunted by a horrendous experience that pushes her to the edge and makes her (and us) question her sanity. Meanwhile, the film also explores serious ethical issues surrounding the act of psychiatric confinement. One thing is for certain, everyone will take greater time to read the small print after watching Soderbergh’s movie. The true horror of Unsane lies in its all too believable premise. After revealing its secrets, the film follows a far more familiar, ultimately less interesting path. However, for a time, you feel this situation could happen to anyone - could happen to you - and that is genuinely terrifying. This is, of course, far from the first time a director has shot a film with an iPhone - see, for example, Sean Baker’s Tangerine. If you have, what did you think of Steven Soderbergh’s movie? Let me know in the comments section below or let’s chat about the movie over on Twitter (@500DaysOfFilm).